At Uclue we have just passed a major milestone – our first thousand questions. Actually, we now stand at 1017 questions including 911 funded questions, of which 640 have been answered. It’s a big milestone for us, and it’s been a fascinating journey. Along the way we’ve discovered what kind of person you can hire to sort through your bills and get your finances in order, how to size I-beams for an overhead traveling crane, what to give to an architect who has everything, whether the middle name of Wayne is associated with criminality, the source of a painting from a distant memory, how much chocolate a young lady could buy for five shillings in 1925, how to calculate the foci of an eillipse, which are the worst organizational charts in the world, how to make a human hamster ball and a thousand and one other fascinating facts. Researcher davidsarokin coined the term kiloclue to describe what is discovered in the process of answering a thousand questions. May Uclue generate many more kiloclues in the years to come! This entry was posted on Friday, November 2nd, 2007 at 9:07 pm	by eiffel	and is filed under Answers Spotlight. You can follow any responses to this entry through the RSS 2.0 feed. Both comments and pings are currently closed. 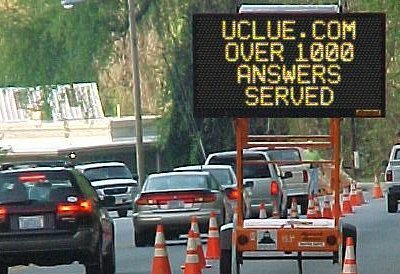 I’m looking forward to Uclue’s first megaclue!